I’m adventurous by nature, although as I get older my fear tends to get the best of me. But that’s topic for another day. When my cousin from Indonesia and his wife visited us last August, my sister and I were looking for something different and fun to do. 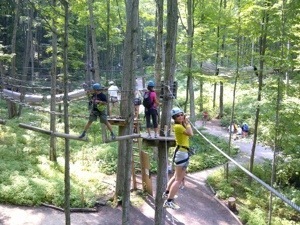 We came across a Groupon or Wagjag deal for a Treetop Trekking adventure at Horsehoe Valley. I checked out the website and although it wasn’t clear to me what treetop trekking entailed, we decided to purchase vouchers anyway to check it out. We went on a Friday afternoon. Treetop Trekking is, as it turned out, basically going through five levels of aerial courses ranging from beginner to extreme. 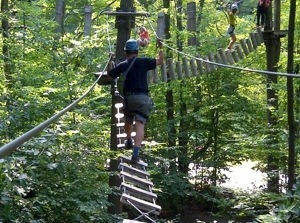 These aerial courses consist of various obstacles fom walking across from one tree to another on a monkey wire to climbing nets to walking across a suspension bridge to zip lining across or down. It seemed a bit cheesy at first, considering they weren’t very high off the ground. Having walked on a suspension bridge 4,600 ft. above sea level in Costa Rica, I thought this experience would be easy peasy. Surprisingly, it was harder than I had expected. Like a lot harder. 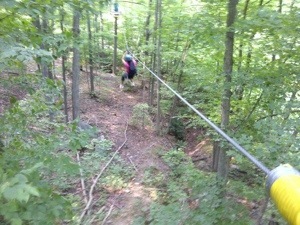 The zip lines were the easiest and the ones I looked forward to the most. The obstacles got longer, higher and harder with each level up. We went all the way to level four when our time was up. A part of me was disappointed we didn’t get to try the most difficult level, and a part of me was relief. I think it was 30/70 actually. I was exhausted and had run out of juice. Not sure I could have made it through another level. 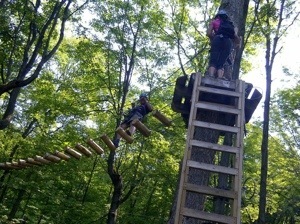 We ended the day by going down the “big zip”. It’s called the big zip because it was long, although I can’t remember how long. Maybe 100 ft.? However, since I’ve zip lined a couple of times including going down ten lines in Costa Rica with the longest being about 2500 ft. long and the highest 500 ft., this was more relaxing than thrilling in comparison. But it was the best way to end our treetop trekking adventure. The best part was that this was practically in our own backyard with it being two hours away from home. We didn’t have to travel across the world to have some adventurous fun and most importantly, my cousin and his wife had a blast! It’s funny how we tend to think that in order to have some real fun and adventure we’d have to go to some exotic place. This experience was an eye opener. 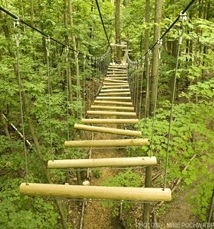 It’s nice to know that something like treetop trekking is available so close to home. I wouldn’t have known about it if it wasn’t for Groupon or Wagjag. It was good times for sure! Have you ever discovered something you didn’t expect to be available so close to home? If so, what was it? First thought that popped into my head when we arrived in Jakarta, Indonesia was….”culture shock”. I know, strange for me to think so considering I was born in Jakarta and lived the first 10 years of my live in Jakarta, Bengkulu and Banjarmasin. That’s three different Indonesian islands I lived in, each with its own dialect and twist on food. But growing up in the Westernized culture of Canada, it was easy to forget what life was like back in Indonesia. During our trip, I saw things that made me go, “huh?” Only in Indonesia! I opened my eyes. Annoyed at having my much needed sleep interrupted, I turned to him and gave him a silent “this better be good” look. And boy was it ever good. 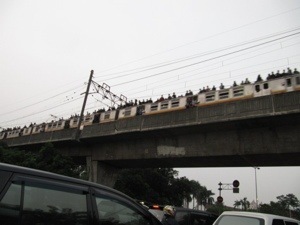 There were people – lots of them – standing and sitting on top of the train. That’s right, not inside but on top. My cousin explained that these people can’t afford to take the train so they jump on the train to catch a free ride. Unbelievable. Only in Indonesia. The traffic is absolutely insane. It’s 100x worse than Toronto traffic and no one follows the rules of the roads. It was so chaotic that I cringed every time a motorcycle or a car or a bus zoomed past us. And trust me, that happened often. Like every second we were on the road. I thought for sure we’d get into an accident. But the amazing thing is, I did not see even one single accident. Due to the insane traffic, the fastest way to get around is by motorcycle. Everyone rides them – kids, adults, men, women, professionals, maids. If you’re in a motorcycle you can zig zag in between the cars. Again, not something we’re used to seeing in Canada. We might see two or three at a time in the summer but in Indonesia, there were at least 20 of them at any given time. Only in Indonesia. While visiting my grandma’s brother, we drove by a house. It was an ordinary house except for the monkey that was chained outside of the gate, sitting on a small covered platform. The monkey is used as some sort of alarm. Only in Indonesia. 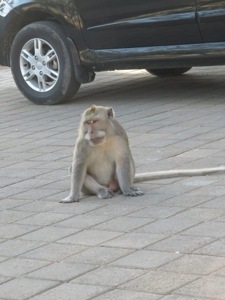 Since we’re on the topic of monkeys, the cruelest thing we saw were monkeys on the side of the street. Not only were these monkeys on a leash, they had on clothing and a mask. 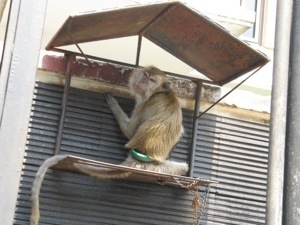 Their owners use these monkeys as a tourist attraction to make money. Similar to what you would see in an all inclusive resort, where locals walk around with a monkey, parrot or snake for tourists to take pictures with. But imagine this – it’s 40 degrees Celsius outside and the monkeys are dressed in a costume of some sort wearing a face mask! Yes, I do have pictures but I’ve decided not to post them due to the wrongness of it. Only in Indonesia. 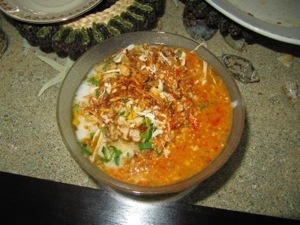 On a more positive note, the food in Indonesia is to die for. You don’t even have to leave your driveway to get food. Food comes to you. 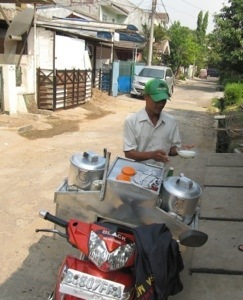 Here’s a picture of a guy selling congee. Only in Indonesia. At the end of our first week, we were off to Manila, Philippines for the weekend to visit friends who just moved there. Then from Manila we went straight to Bali for 5 days, which was too short in my opinion. Only in Bali would you see two monkeys sleeping and cuddling with each other at a restaurant out in the open! No cage, no special room. Just in the restaurant. Only in Indonesia. Bali is known for its monkeys though, so I guess that’s pretty normal there. 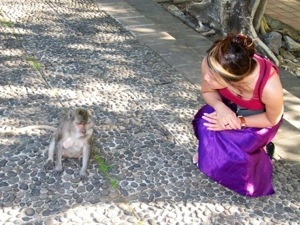 When we went to Ulu Watu temple, we saw more monkeys of course. They roamed on the streets just like stray cats. Only in Indonesia. Ahh, I love reminiscing about our trip to Indonesia. This is why I love traveling. It makes me see how life is like in other parts of the world and how different it is from Canada. What a refreshing way to view the world. When I was little I used to read a book series about a girl who got struck by lightning. But that’s not what fascinated me about the story, it was that she had a horse and knew how to ride them. I used to dream of someday being a jockey, possibly even own one. I dreamt of riding my horse down Rathburn to my best friend’s house, much to the envious looks of passerbys. Forget bicycles, motorcycles or cars. I wanted a horse. I never did get a horse (surprise, surprise) and my fascination with horses was quickly replaced by hanging out at Square One, Falafel’s and Mikey’s (a billiard “dump”). But one day, a friend called me and asked me if I would be interested in going horse back riding as he was organizing a group outing. Are you kidding me? Of course I was! He didn’t know how much I loved horses or anything so it was pure coincidental. And so off we went to some ranch in burlington for our very first horseback riding experience. It was a bit cheesy since the horses trotted along a very short and narrow trail so slowly that a turtle could’ve easily passed us. But that didn’t matter. What mattered was, I rode a horse! Happy dance, happy dance! I still remember her, Peaches. She was a cream coloured beauty who I quickly got attached too during the 15 minute ride. I got my fill and I was good. 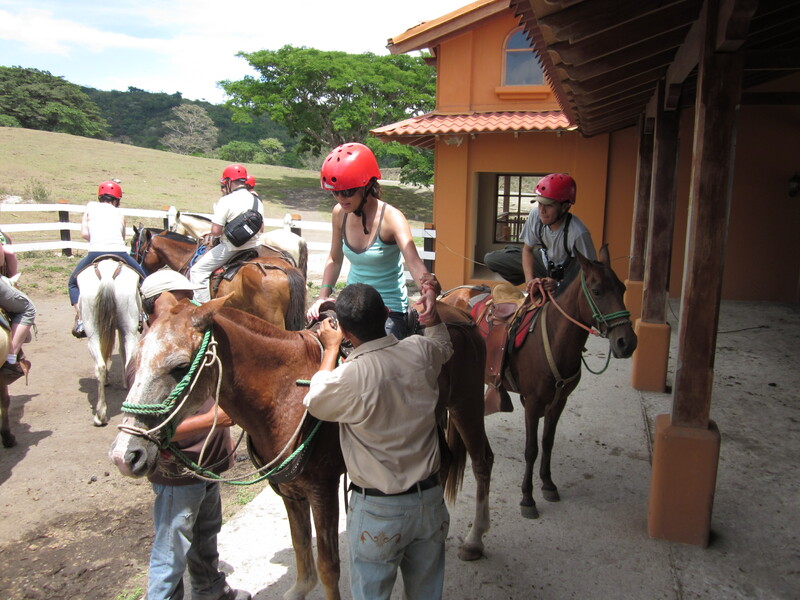 Hubby and I went on a full-day excursion in Costa Rica that started off with a mud bath in the hot springs, followed by a 45-minute horseback ride up the mountains before ending the day zip lining down 10 lines. 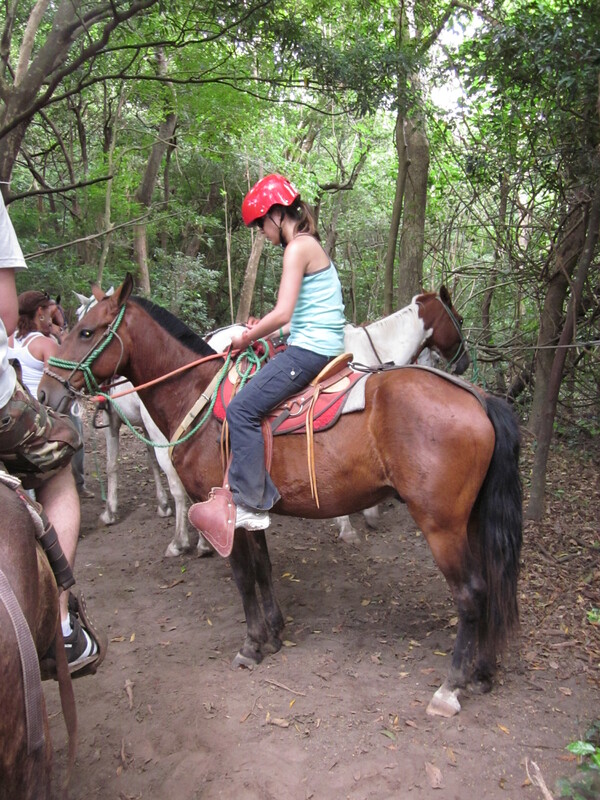 Yes, that’s right, horseback riding! Imagine my excitement. At first, they gave me a really big horse, my feet couldn’t even reach the stirrups, so I asked for a smaller horse. The guide reluctantly brought one out for me (apparently the last horse they had). At first, I wasn’t sure why he didn’t want to give me the smaller horse, but I soon found out. We were all trotting across a wild field minding our own business when my horse decided he didn’t want to be one of the last ones, so he started galloping and pushing the other horses out of the way. Then he kicked the horse in front of me. Oh boy. What did I get myself into? That was when I found out his name meant “kicker” in Spanish. Light bulb went off! 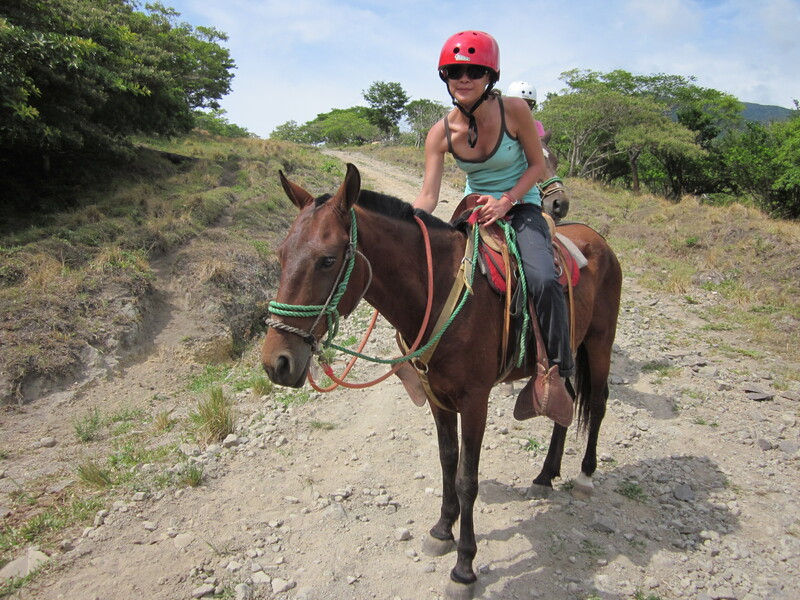 So that was why the guide initially gave me the bigger, apparently much gentler horse. Ding ding ding! I didn’t mind though, it made the ride very entertaining and fun. I didn’t want to go too slow, and Kicker made sure we didn’t. We galloped and kicked the other horses all the way to the top of the mountains, with me constantly apologizing to all the other riders. I did learn to control him a little bit by using the reins, petting him and changing his name (at least temporarily) to “good boy”. That was a really fun day, one I will never forget. I got to ride a horse named Kicker, what more could I have asked for? How about you? What was a really fun day for you? And did you ever dream of owning a horse? Or maybe it was something else – a monkey, an elephant or maybe a tiger?